Saturday’s Irish Cup tie between Linfield and Warrenpoint Town has been postponed over the ongoing Darren Forsyth eligibility dispute. It emerged at the weekend that Warrenpoint striker Forsyth may have broken the rule of playing for more than two clubs in one season. It means the Milltown club could be expelled from the Irish Cup, and be deducted five points accumulated in Danske Bank Premiership games Forsyth played in against Ballinamallard United, Cliftonville and Glenavon. 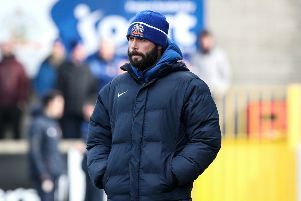 Forsyth was used as a substitute in Warrenpoint’s Irish Cup fifth round win against Coleraine on January 10. Barry Gray’s side were due to play Linfield in the last 16 this weekend – but now that fixture has been postponed to Monday, February 16. If found guilty of fielding an ineligible player, Warrenpoint will be dumped out of the competition with Coleraine being reinstated. “It is alleged that the player may have played in official matches for 3 different clubs this season in contravention of both FIFA and IFA player registration regulations,” the IFA said in a statement.